what others think of you can have a big impact on how you view yourself. You can get a general idea of how others view you by the way they react or respond to you. people generally act nice towards me when I'm nice and in a good mood, but when I'm acting angry the view me as aggresive. self concept is the way you see yourself. people often look at things such as religion, social media, family and friends as a part of their self concept. For some people comparing yourself to others is a way to figure out how smart or competent you are. when I played the clarinet in band we often compared our talents. 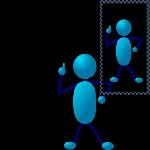 self evaluations is one of the most important ways to form a self concept. People do this by reacting to their own behavior. self esteem is the way you determine how much you mean to the world. some people have some very high opinions of themselves and think that they are basically gods gift to the world. people with very low self esteem think that they are basically worthless and have nothing to offer. examples on how to boost yourself up. Do things that will make you more successful in life. remind yourself of what you have accomplished thus far in life. surround yourself with people that love and care about you that help lift you up and make you laugh. Blind self is qualities about you that you're blind to that others can see. Your hidden self is qualities and things about yourself that you keep hidden. open self is essentially every behavior, attitudes, and feelings that you have . Someone's unknown self is what neither you nor anyone else knows about you. Basically hidden qualities that known including you can see.